^ 1.0 1.1 Lewison, R.; Pluháček, J. Hippopotamus amphibius. IUCN Red List of Threatened Species (IUCN). 2017, 2017: e.T10103A18567364 [2 June 2018]. doi:10.2305/IUCN.UK.2017-2.RLTS.T10103A18567364.en. ^ ITIS on Hippopotamus amphibius. Integrated Taxonomic Information System. [29 July 2007]. （原始内容存档于26 August 2014）. ^ Eltringham, S.K. The Hippos. Poyser Natural History Series. Academic Press. 1999. ISBN 0-85661-131-X. ^ Tsagkogeorga, Georgia; McGowen, Michael R.; Davies, Kalina T. J.; Jarman, Simon; Polanowski, Andrea; Bertelsen, Mads F.; Rossiter, Stephen J. A phylogenomic analysis of the role and timing of molecular adaptation in the aquatic transition of cetartiodactyl mammals. Royal Society Open Science. 2015, 2 (9): 150156. ISSN 2054-5703. doi:10.1098/rsos.150156. ^ 6.0 6.1 Ursing, B.M. ; Arnason U. Analyses of mitochondrial genomes strongly support a hippopotamus-whale clade. 皇家學會報告. 1998, 265 (1412): 2251–5. PMC 1689531. PMID 9881471. doi:10.1098/rspb.1998.0567. ^ 7.0 7.1 7.2 Gatesy, J. More DNA support for a Cetacea/Hippopotamidae clade: the blood-clotting protein gene gamma-fibrinogen (PDF). Molecular Biology and Evolution（英语：Molecular Biology and Evolution）. 1 May 1997, 14 (5): 537–543. PMID 9159931. doi:10.1093/oxfordjournals.molbev.a025790. 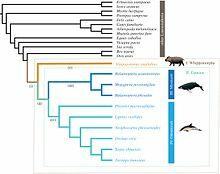 ^ Geisler, J. H.; Theodor, J. M. Hippopotamus and whale phylogeny. Nature. 2009, 458 (7236): E1–4; discussion E5. PMID 19295550. doi:10.1038/nature07776. ^ 9.0 9.1 Sanders, Robert. Scientists find missing link between the dolphin, whale and its closest relative, the hippo. Science News Daily. 25 January 2005 [8 January 2011]. （原始内容存档于26 February 2015）. ^ Boisserie, Jean-Renaud; Lihoreau, Fabrice; Brunet, Michel. The position of Hippopotamidae within Cetartiodactyla. Proceedings of the National Academy of Sciences. 2005, 102 (5): 1537–1541. PMC 547867. PMID 15677331. doi:10.1073/pnas.0409518102. ^ 11.0 11.1 Owen-Smith, R. Norman. Megaherbivores: The Influence of Very Large Body Size on Ecology. Cambridge University Press. 1992. ^ Pienaar, U. de V.; Van Wyk, P.; Fairall, N. An experimental cropping scheme of Hippopotami in the Letaba river of the Kruger National Park. Koedoe. 1966, 9 (1). doi:10.4102/koedoe.v9i1.778. ^ Stewart Keith Eltringham. The Hippos: Natural History and Conservation. T & A D Poyser Natural History. 1999. ^ Marshall, P.J. ; Sayer, J.A. Population ecology and response to cropping of a hippopotamus population in eastern Zambia. The Journal of Applied Ecology. 1976, 13 (2): 391–403. JSTOR 2401788. doi:10.2307/2401788. ^ 15.0 15.1 15.2 Kingdon, J. East African Mammals: An Atlas of Evolution in Africa, Volume 3, Part B: Large Mammals. University Of Chicago Press. 1988: 256–77. ISBN 0-226-43722-1. ^ Estes, R. The Behavior Guide to African Mammals: including hoofed mammals, carnivores, primates. University of California Press. 1992: 222–26. ISBN 0-520-08085-8. ^ Oldest Hippo Turns 55!. Mesker Park Zoo（英语：Mesker Park Zoo）. 12 June 2006 [21 June 2007]. （原始内容存档于27 September 2007）. ^ Celebrate with Donna. Evansville Courier & Press（英语：Evansville Courier & Press）. 12 July 2007 [15 July 2007]. ^ Fears, Danika. Goodbye, Donna: World's oldest hippo in captivity dies at 61. Today.com. 3 August 2012 [12 September 2013]. （原始内容存档于4 June 2013）. ^ van Kolfschoten, Th. The Eemian mammal fauna of central Europe (PDF). Netherlands Journal of Geosciences. 2000, 79 (2/3): 269–281. （原始内容 (PDF)存档于24 July 2011）. ^ Horwitz, Liora Kolska; Eitan Tchernov. Cultural and Environmental Implications of Hippopotamus Bone Remains in Archaeological Contexts in the Levant. Bulletin of the American Schools of Oriental Research. 1990, 280: 67–76. doi:10.2307/1357310. ^ Haas, Georg. On the Occurrence of Hippopotamus in the Iron Age of the Coastal Area of Israel. Bulletin of the American Schools of Oriental Research. 1953, 132: 30–34. doi:10.2307/1355798. 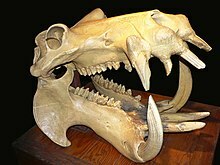 ^ The Hippopotamus Going - Extinction of the huge species at hand. The Sydney Morning Herald. 7 October 1898 [14 July 2017]. ^ Hippo Haven. 史密森尼 (雜誌). 1 January 2006 [23 January 2007]. 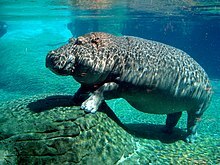 ^ 27.0 27.1 DR Congo's hippos face extinction.. BBC. 13 September 2005 [14 November 2005].